In our several years in the organ service field, we have come across many instances where misunderstandings or lack of information concerning the temperature needs of a pipe organ have caused frustrating situations. We feel it is good to brush up every now and then on the principles involved, in hopes that a more complete education on the topic can help foster a better musical experience with an instrument. With that in mind, I present this “primer” of sorts with just that intention. Of all the considerations one makes in the design and eventual stewardship of the “king of instruments”, stability should be a prime consideration. Just as an airline pilot depends on his controls working perfectly every time, so too an organist depends on his instrument behaving itself predictably so that together they can smoothly execute the musical ends they serve. Just as the skills involved with building an aircraft must be informed by science, so too must an organ craftsman or technician be informed by the scientific principles at work. At what temperature should the organ be tuned? When we come to tune, and especially when we come to tune a new client’s organ, the first thing that must be determined is the pitch of the organ. Less important than the actual number is the relationship between the pitch and the temperature when the organ is tuned. Standard orchestra pitch is A=440Hz, and the organ usually gets pitched so that tenor A on a 4′ stop =440Hz at the ambient room temperature of 70ºF. As the temperature goes up, the pitch rises, and as it falls, the pitch lowers. Reed pipes like Trumpets and Oboes rise and fall at a slower rate than flue pipes. This is why it is so important that the tuner knows what the proper tuning temperature is in the room, and that the room is stabilized at that temperature when the organ is tuned. It is also important that the room be brought within two degrees of that temperature when the organ is used in functions, to ensure proper tuning. (Playing the organ at lower or higher temperatures will not damage the organ, but the tuning, especially between the reeds and the flues, will be sour). It is often the case that factors have caused the normal occupied temperature of a room to change, from one tuning to the next. Our firm can easily catch this when we arrive, as we can verify the previous tuning temperatures through our service records. We try to determine if changes have occurred prior to our often long journey to a tuning, so we can advise and plan accordingly. More often than is desirable, we only learn of such a change when we arrive. Depending on the individual scenario, the outcome can vary from carefully proceeding with a tuning (which always involves more time) to having to reschedule. We always recommend that clients make an informed decision about what the occupied temperature should be in their venue and stick with it. Lock boxes can and should be installed over thermostats if there is a risk of the uninformed changing the temperature. How long before a tuning must a room be brought to proper temperature? We usually recommend the room be heated/cooled at a minimum of four hours from a fallback temperature prior to a tuning, to give the room time to stabilize. Especially true with heat, certain types of HVAC systems will in effect overheat the air in the room initially, especially higher in the room where the hot air is artificially forced. This will even out as the room temperature rises and the air mixes, especially if there are air circulating devices in the room (ceiling fans, erc. . .) Even though the thermostat will display the correct room temperature, the heat has not had time to properly dissipate throughout the room, and the organ will be a mess. Our firm always takes stock of the pitch and temperature of the divisions of the organ for every tuning. As a result, we can absolutely tell when, for instance, a venue waited until the last moment to adjust the temperature for the tuner. Though we are assured that these occasions were well-meaning attempts to save money, the reality is that we are not able to provide service under this condition. We do our best to turn these situations into educational experiences. Practically speaking, tuning an organ in an un-stabilized temperature situation will always result in a poorly-tuned organ. We have witnessed well-meaning technicians attempt to “reconcile” things in this scenario, and the results were less than satisfactory (meaning, they were called back to fix the mess once things stabilized). If there is any doubt as to how long the room needs to stabilize, our firm offers a temperature analysis using temperature-logging devices that can track temperature changes over time, which will give a very informative picture of what is going on in the organ chambers. With this data, we can discuss changes that need to be made, which could involve adding insulation or air circulation, or something as simple as making adjustments to the thermostat at particular times. I must digress here from the format to address this point emphatically. 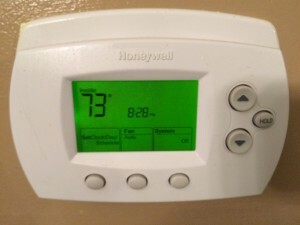 Over the past five years, we have witnessed an increase of a disturbing trend where our clients had every intention of providing a well-stabilized room, having set the thermostat back the night before, only to have their settings overridden by the thermostat programming. This is usually not discovered until our arrival, and much to everyone’s horror. And there is nothing to be done but try to either wait or reschedule, if possible. Must the Room Temperature Remain Constant for the Organ? One of the most frequent questions we receive is whether the organ requires a constant temperature or whether the room temperature can be set back for efficiency’s sake. The first principle at play is that, barring extremes of temperature or humidity in either direction, the room temperature can be set back a reasonable interval when the room is unoccupied, as long as sufficient time is given to allow the room to stabilize at the tuning temperature before events. So if the organ is tuned at 70ºF for Sunday services, and the room is set back to 65ºF during the week, the organ should be well in tune when the temperature is brought back to 70ºF the following Sunday. How far back to let the heat or a/c slip without affecting stability is a well-debated topic. Though the flues and reeds will generally float up and down without a problem, a drastic change in temperature may alter the relationship of the speech parts of the pipes, especially in the reeds, and may cause them to be out-of-tune or off-speech when the temperature is returned. It may be well to consult with your tuner to discuss this, and to experiment with this in your particular room, under close observation. Of course, the greater the interval between the occupied and unoccupied settings on the thermostat, the longer the room will need to stabilize at the occupied setting. Many of our clients have actually found that greater efficiency is actually achieved by limiting this interval, as it is surprisingly often more efficient to maintain one temperature than to let the temperature float back too far, resulting in an often long “catch-up” period that can offset any savings. Of equal concern, however, is the effect of humidity on an organ relative to the temperature. Most of the large parts of an organ (chests especially) are made with wood, which swells and compresses as the humidity changes. These wood parts are especially affected over time by dry conditions, brought about by artificial heating. Leather is also affected by humid conditions. These are often exacerbated by the fact that organs are often mounted higher in a building, where the temperature is even higher, and the relative humidity swings are more exaggerated. If the air in the room is not humidified in the winter, it is probably best to allow the room temperature to fall back, to reduce the usual plunge of the relative humidity of the air. Air circulation systems can also help mix the very hot air at the top of a tall building, and reduce the “bandwidth” of stratification between the higher and lower portions of a room. Air conditioning is less of an issue as far as humidity is concerned. Also, while carefully-placed chamber humidifiers may provide marginal help, the most ideal scenario for overcoming winter dryness is a humidification system that humidifies the air in the whole room. This will not only help the organ, but will also extend the life of any other musical instruments, such as a piano, or any wood furniture present. Ceiling fans should not be placed in close enough proximity that they interfere with the sound of the organ. One caveat to this is that sometimes it is necessary to add a circulating fan to focus ambient air into an organ chamber that has “dead spots” where the temperature will not mix properly. These fans should turn off when the organ comes on. Good case and chamber design can mitigate this necessity. Also, any circulation devices should be installed in close consultation with your organ service company. It should also be noted that any lights mounted around the organ will give off heat and affect tuning. We recommend these stay on during tunings. An increasing number of our clients are switching to low-heat bulbs, such as LEDs, which will greatly minimize this effect. The temperature can be set back a few degrees without changing the tuning, as long as sufficient time is given to allow the room to stabilize at the occupied temperature for events. The organ chambers should be heated passively from the room, and there should be no vents or fans blowing directly towards the pipework. In closing, I hope this has helped to convey the basic principles involved in the interaction of an organ with its environment. Putting these principles into practice should help to create a more stable tuning situation. If it seems like changes to your venues’ environment are necessitated, we always recommend including your organ service technician in the conversation. Wonderful ! I cannot stress how true and accurate the information provided by Mr Schroth, really is. I would only add in print, possible ways to prevent misunderstandings I have experienced as a tuner and technician, attempts to achieve the stability Mr Schroth has so presented so clearly, without communicating with him, first. I think he has presented the stability issue, thoroughly. I have arrived at locations on dates arranged far in advance, to find a temperature situation that made tuning unwise or simply impossible. Thanks for making the importance of stability, clear, and easily understood. I would love to discuss some of the circumstances that some people deal with.